The 15th ranked Catholic University Men’s Lacrosse team continued their commanding season with a 12-11 overtime win against the Gopher Gouchers. The home game continued the best start in program history, improving their record to a flawless 4-0 in Landmark Conference play, and 12-1 overall. The game began very slowly for both sides, with neither team gaining a clear advantage until there was only 8:31 remaining in the first quarter. Following a shot by CUA’s Tony Fisher and a Goucher clear, the Gophers managed to gain an upper hand on a rip from Pierce Bailey giving the away team a 1-0 lead. Fortunately, the Cards bounced back immediately on senior Ethan Rodriguez’s 10th goal of the season only 67 seconds later. The 15-minute period soon lit up with both sides exchanging goals throughout the remaining time. Bailey once again scored for Goucher with 4:10 on the clock to give his team a one goal lead. The CUA side managed to grab the next two goals, with Fisher, a senior attacker from Ardmore, Pennsylvania, scoring his 7th on the season. Junior Bennett Bradley had a stand out showing for the Cards, scoring 6 of Catholic’s 12 goals. The performance brought Bradley’s career goal to 74, including his first to give the Cardinals a 3-2 lead going into the second period, and to a total of 38 on the season. Bradley also contributed an assist deep in the third to give the attacker a 7-point day. The second period proved to be a lopsided one as the Gophers dominated their opponents. The Goucher team outscored the Cardinals 4-1 in the half, and maintained constant possession throughout the period and outshot the Birds 13-4 on the period, creating a deficit heading into the half. Bradley was able to stop the bleeding for the Cardinals, scoring a goal with a little over a minute to play to leave the Cardinals a two-goal deficit after the first 30 minutes, 6-4. The Cards responded almost immediately in the opening quarter of the second half, with the game’s hero, Bradley, scoring his 3rd goal of the game only 1:28 after play resumed. This rapid goal kickstarted a six-goal effort from 4 different players. The Goucher side was only able to answer with two of their own, giving the birds an 8-10 lead entering the final period of regulation. The CUA team saw many great performances in the tightly fought game. Rookie goalie Alex Muryk was a bulwark in net, managing to stop 15 shots while advancing his record to 7-1 in net. Senior Jack Murphy registered a goal and 4 assists in the game, including an assist on the game winner for a 5-point day. The fourth quarter would prove to be a battle, with each side playing their hardest to gain the upperhand. The Goucher team scored within the first two-minutes of play, pulling within one of the Cards, 10-9. They followed up their opening score with two more to gain an 11-10 advantage over the home side with only 3:28 to play. Bradley once again rose to the occasion for his team, tying the game at 11 all, only 28 seconds after Goucher for his final goal of the night. Overtime was a stalemate with both sides struggling to find the back of the net until a little less than two minutes to play in the 4-minute period. Senior attacker Tim Keith, an All-American selection last season had a quiet game. The King of Prussia, Pennsylvania native only recorded 1 assist and 3 shots on the game, but proved to be the star the team needed. 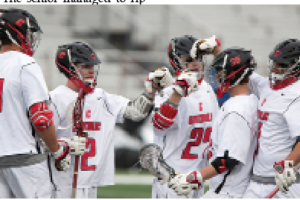 The senior managed to rip one goal home off of an assist from Murphy, giving the Cardinals a 12-11 victory. The Catholic side sits at the top of the Landmark Conference and looks to take the top seed in the upcoming conference playoffs. The Cards will return to action on Saturday, April 22nd against conference rival Moravian College at Cardinal Stadium for Senior Night. The team will be honoring 14 members for their accomplished careers at Catholic prior to the game, which will be the Senior’s final regular season home game.